Do you want the European Union to be able to mandate the obligatory settlement of non-Hungarian citizens in Hungary even without the approval of the [Hungarian] National Assembly? Prime Minister Viktor Orbán speaks to supporters following the referendum on the European Union migrant-resettlement quota (photo: index.hu). This question refers specifically to the resettlement of 1,294 Syrian, Iraqi and Eritrean refugees from Italy and Greece to Hungary as part of a European Union plan adopted in September 2015 (see 2016 Referendum on European Union Migrant Resettlement Quotas). The result of the referendum in terms of approval or rejection of the European Union migrant-resettlement quota for Hungary was never in doubt: opinion polls consistently showed that the number of voters who rejected the quota was many times larger than the number of voters who accepted it (see “Opinion Polls” section of the relevant Wikipedia article). The only question was: would voter turnout exceed the 50-percent threshold required for the referendum to be considered legally valid? 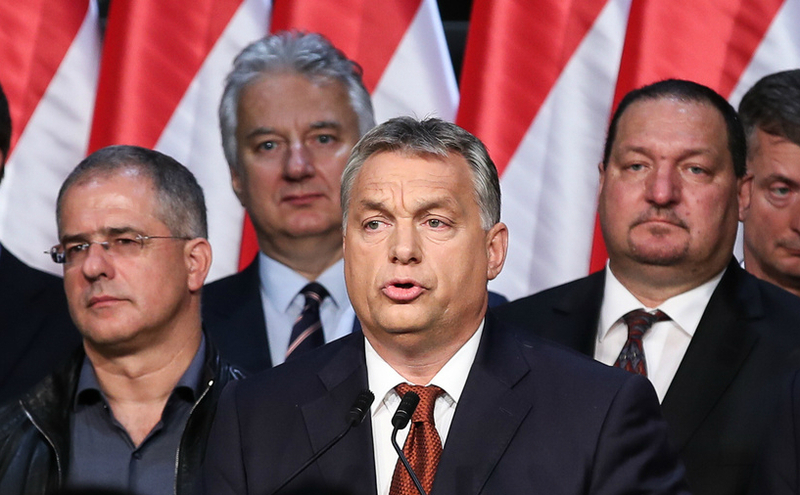 This combination of factors impelled most voters who opposed the Orbán government’s initiative, regardless of whether they supported the European Union resettlement quota or not, to either boycott the referendum or to cast invalid ballots in the hope of preventing turnout from reaching the required 50-percent validity threshold. However, the boycott/invalid-ballot strategy entailed the drawback of ensuring that referendum would produce a landslide victory for the “no” votes rejecting the resettlement quota. The Orbán government was clearly prepared to emphasize the aspects of the referendum results that best served its political interests—the voting outcome, the turnout, or both—and to take legislative action of some kind to prevent the European Union from resettling migrants in Hungary regardless of the specific result. “Let’s Not Take a Risk! Vote No! October 2”: Orbán government anti-quota referendum sign in Budapest (photo: Orange Files). On September 22, Prime Minister Orbán said in an interview: “If it [the referendum] is successful and of convincing strength, then it will produce steps of a different nature than if it is turns out to be scrawnier. This is why it isn’t worth speculating now. Although naturally the referendum will have consequences in terms of public law” (source in Hungarian). The final results of the October 2 “Referendum against Compulsory Resettlement” permitted the Orbán government to emphasis only the outcome: 98.3 percent of those who cast valid ballots in the plebiscite voted “no” to the EU migrant-resettlement quota, while only 1.7 percent voted “yes.” The Orbán government referred only indirectly to the fact that voter turnout for the referendum was only 40.4 percent, nearly 10 percentage points below the validity threshold (source in Hungarian). 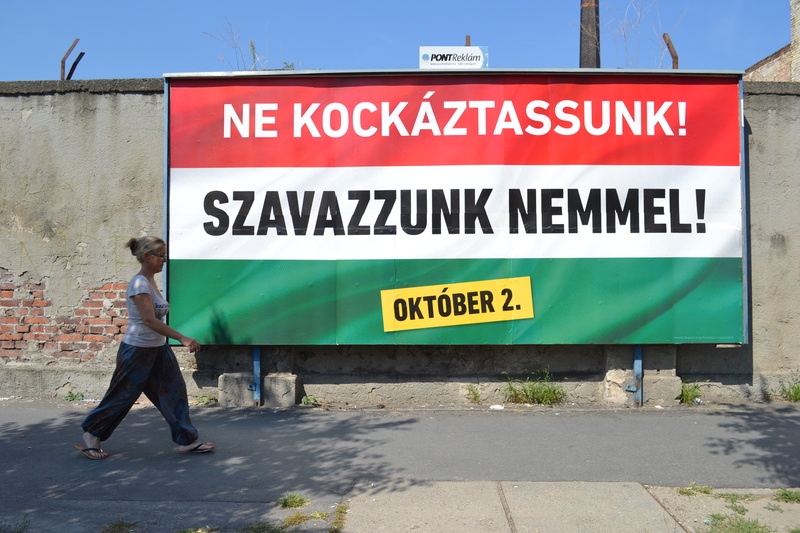 Thus the Orbán government’s intensive, seventh-month propaganda campaign, which included ubiquitous billboard signs, electronic- and print-media advertisements and brochures exhorting the electorate to vote “no” in the referendum—a campaign that the opposition website Átlászó.hu estimated cost 15 billion forints (48.7 million euros)—had no apparent effect on the outcome of the referendum, serving only to further elevate political tension in Hungary to nearly hysterical heights (see The Phony Realist). And the referendum itself, in practical terms, was virtually meaningless: the speech that Prime Minister Orbán delivered in Budapest following the close of polls on October 2 could have been written six months ago as one of just two possible versions—that emphasizing the overwhelming majority of “no votes” and avoiding any reference to voter turnout and legal validity. Below is an Orange Files translation of Prime Minister Orbán’s post-referendum speech (see video of speech in Hungarian). Thirteen years after we decided in a referendum by a large majority to join the European Union, tonight we Hungarians again made our voices heard with regard to a European issue. We achieved a magnificent outcome, because we surpassed the result of the referendum on joining [the European Union]. A total of 3,056,000 voted to join in the referendum on joining [the European Union] and now we’re at 3,204,000 and we still don’t know most of the votes from Hungarians beyond the borders. And perhaps I should say here as well that some 15 percent more people took part now than during the most recent European parliament election. Thus the weapon will be pretty strong in Brussels as well. First I would like to congratulate everyone and express my recognition to those who, feeling the gravity of the issue, participated in the referendum. They came and contributed to the fact that this enormous agreement of more than three million could come about. With regard to the participants, today nine of ten people voted on the side of Hungary, on the side of Hungary’s right to make independent decisions. I feel that we can be proud that as the first and until now only European Union member state [to do so], the Hungarians were able to directly express their opinion regarding the question of immigration. This was the proper, even honorable thing to do. This question was not yet on the agenda during the 2014 parliamentary election. Therefore, citizens were not able to take a stand on this and could not formulate their opinion. However, esteemed ladies and gentlemen, this is perhaps one of the more important questions of the years ahead of us, one that is about the future of Hungary and the future of our children and grandchildren. Who we live together with, what will become of our culture, what will become of our way of living until now, our economic system that we restored with great difficulty, what will become of our Christian roots. A modern migration of peoples is taking place in the world. The waves of this have spectacularly and painfully reached Europe. The question now is, how will the European Union respond to this? The proposal of the union is that we let the migrants in and distribute them with obligatory force among the member states. And that Brussels decide about this distribution. Esteemed ladies and gentlemen, we Hungarians have today considered this proposal and rejected it. The Hungarians decided that only we, we Hungarians, can decide who we want to live together with. Brussels or Budapest, this was the question, and we decided that this right to decide lies exclusively with Budapest. Today we started down a path. And it will be a very long path. We took the first and most important step. Serious battles and difficult engagements await us on this long path. Now, following the celebration, we must do two things in order to assert our will. First we must invest the decision of the people with the force of public law. For this reason, I will place a proposed constitutional amendment on the National Assembly’s desk over the coming days. I believe that we must convey the will of the people expressed today. And we must place this in our Fundamental Law as well. The other urgent thing is to enforce the decision we made today in Brussels as well. Brussels stands before an important decision. Now it is the one that stands before an important decision. The European Union is a democratic community. Today in a member state 92 percent of the participants in a referendum declared that they do not agree with the intention of Brussels. The question is simple: can Brussels do this? Can the democratic community of European states force its will upon a member state, where 92 percent of participants are against it? I promise you, I promise all citizens of Hungary, that we will do everything under our power so that this does not happen. . . .